lt is no secret that video games have you kill a lot of people. If you have played them with any sense of regularity, chances are that by now you have gunned down tens of thousands of monsters, terrorists, and soldiers across the ages. Every few years, games go through distinct phases where enemies all seem to be the same type. We’ve had the World War 2 era, where Nazis were the cannon fodder of choice. Before that we had monsters and mutated freaks. Russian and Chinese soldiers were the flavor of the month for a while, and the zombie craze is still ongoing. Generic terrorists are always a good fallback, and it’s no surprise when a popular game relies on one of these clichés for their antagonists. But as our world becomes more complex and our threats become more fluid it has raised interesting questions for players and developers, and it asks us: Who is the next target? The last shift away from terrorists was towards the North Koreans. They were dominating headlines with their threats and attempts to build a nuclear arsenal. With Red Dawn being remade for a modern era, games followed in their footsteps to cast this new threat as the bad guys holding guns. In one of the shorter-lived phases of our day, they were quickly cast aside. Players didn’t buy into their threats and felt they were an unrealistic enemy. As their threats ballooned and they were lampooned in the media, with The Interview taking high profile jabs at the entire country, developers knew that they needed to look somewhere else for their enemies. So they turned to the future. Private military corporations (PMCs) have been the target of public ire for more then a decade for their role in conflicts abroad, and their capitalist approach to war. They were the perfect targets. Motivated by profit over morals, being able to be bought out by the highest bidder, using the latest technology, and being filled with faceless mercenaries of all nationalities. Nothing to feel guilty about gunning down. They were willing coconspirators in whatever evil plan was being battled this week. 2008’s Metal Gear Solid 4: The Guns of the Patriots was ahead of its time in building the conflict around these companies. 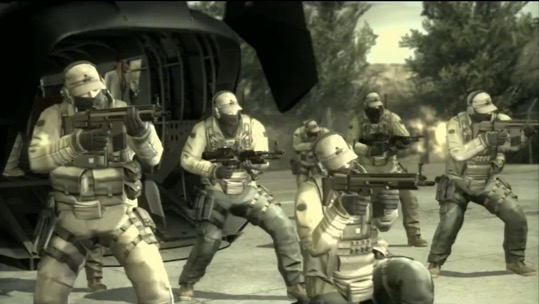 A distinct shift away from earlier titles, the game attempted to become a geopolitical thriller of sorts, casting PMCs as the main actors in its conflicts. The changing face of war had arrived where companies did the fighting. And while it took a few years, recent titles have followed in this trend, with Call of Duty: Advanced Warfare putting Kevin Spacey’s analogue in charge of one such group that your character works for. The most important part about these groups is that you don’t feet bad about killing their soldiers. In this new era where morals come into play in every game you see, the idea that you have an enemy that you don’t question about killing is very attractive to developers. Generic soldiers motivated by greed fit the bill to a T. It allows you to hop the globe at will instead of being stuck in any region, because these are multinational corporations instead of small Middle Eastern countries. The gear you encounter can be more varied and high tech, because they have the budget to back cool R&D. The game can be played in any country without offending anyone, because the enemy is generic Caucasian soldiers. Where does this trend take us next? The two big shooter franchises (Call of Duty and Battlefield) are leaping forward and backwards in time respectively to attempt to solve this question of who to fight next. Deus Ex has you questioning if authority itself is good. Doom gives you a chainsaw and a license to kill. It appears that games are finally willing to diversify. They don’t have to challenge each other in the same space. I remember the heated back and forth between Call of Duty: Modern Warfare 2 and Battlefield: Bad Company 2. It seems that companies have learned that by attempting to be the same thing, neither one wins. It looks like we can finally see some different ideas in the industry. We don’t know where we will go or whom we will fight next. Only that we will be fighting.